Medical Center researchers Ahmed Ghazi and Jonathan Stone are developing a process to create anatomically correct life-sized models of organs that can be adapted to highlight specific scenarios that affect organs, such as how cancerous growths appear on kidneys. 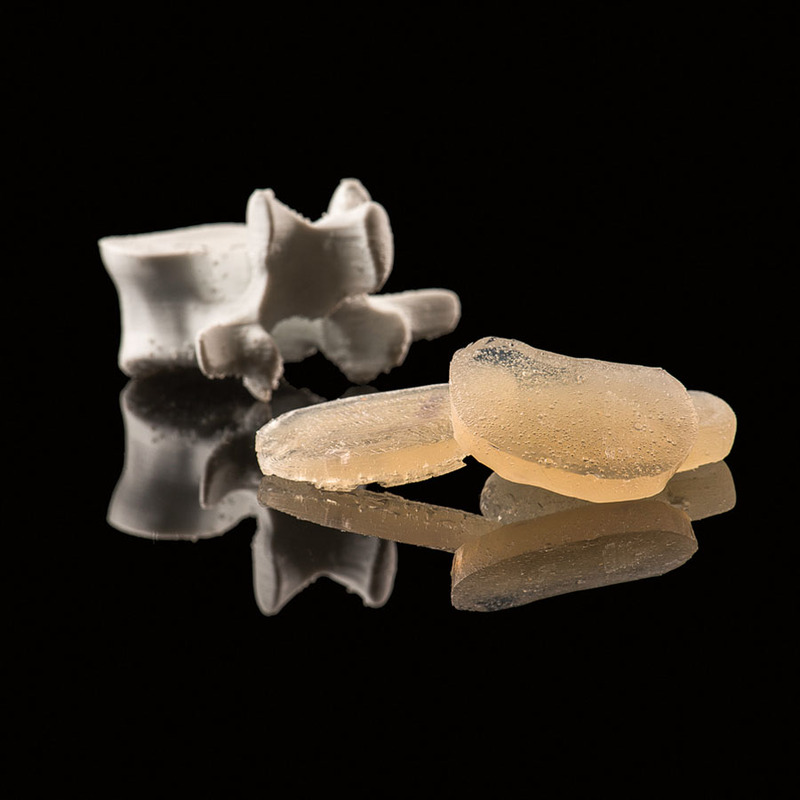 Using 3-D printers encoded with data from MRI, CT, and other scans, researchers make a mold that can be filled with a Jell-O–like polymer to create the model organs. As part of a research initiative to develop new ultrasound technologies, University researchers Michael Richards and Doran Mix are using 3-D printing technology to model blockages in major arteries like the aorta. The goal of the project is to help diagnose dangerous medical conditions hidden in the abdomen and under other organs and tissues. 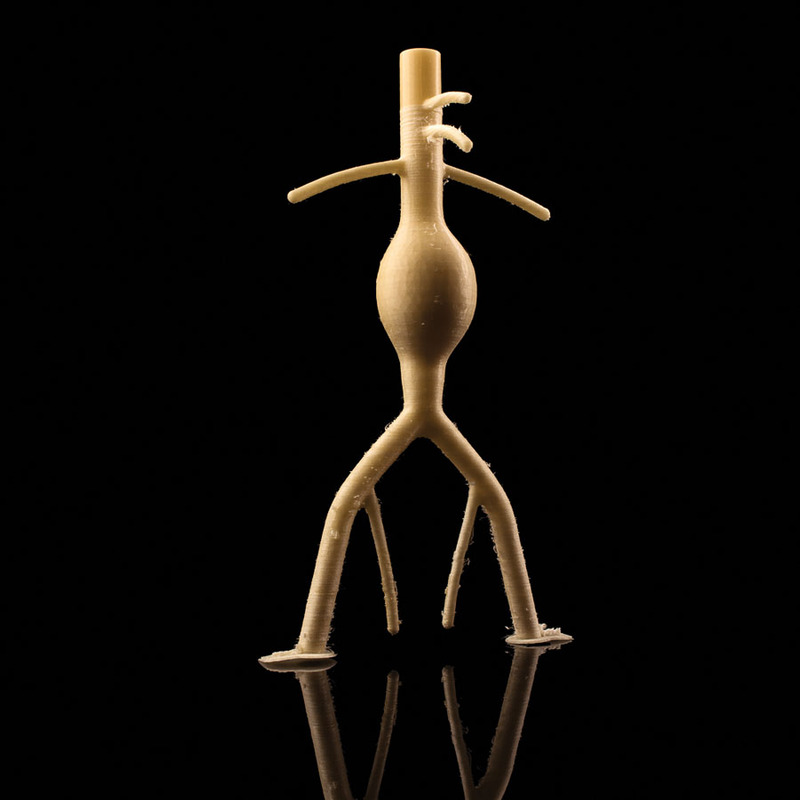 Using 3-D–printed models of aneurysms made with polyvinyl alcohol, a water-soluble synthetic polymer, the team inserts the model aneurysm into a material that mimics the human thoracic cavity. 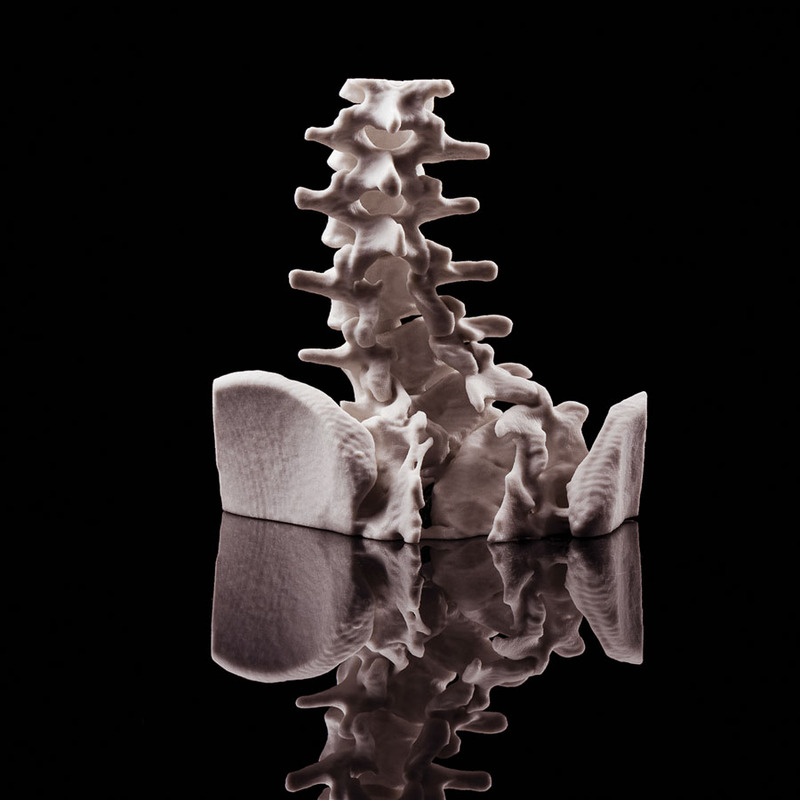 The printing process can also be used to model spinal discs. Experimenting with different types of 3-D printing technologies, the lab of Hani Awad, a professor of biomedical engineering and of orthopaedics, is using the technology to fabricate bones and bone scaffolds. 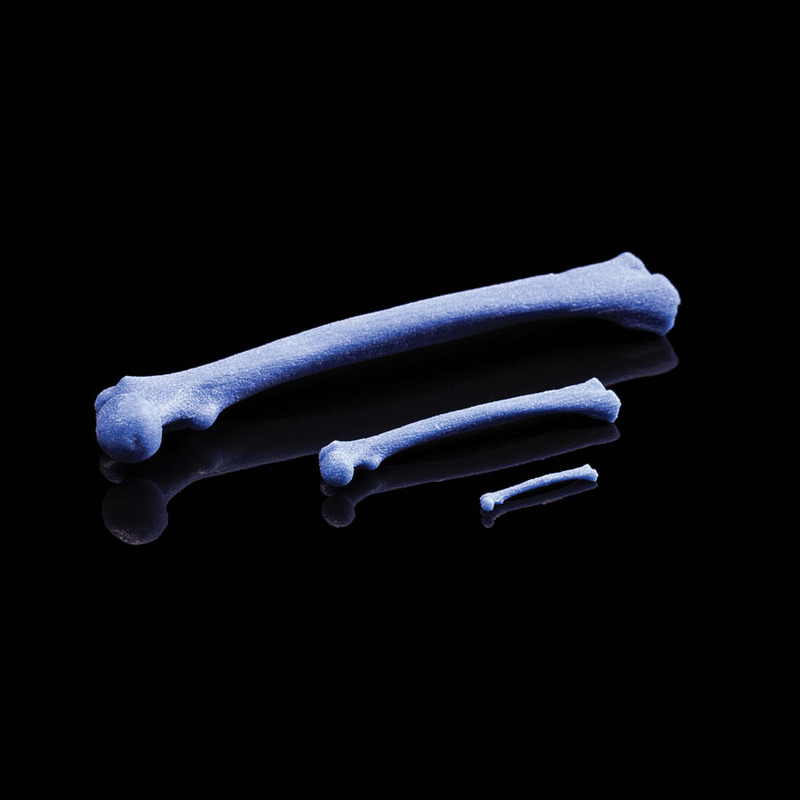 The 3-D printed bones and scaffolds can be encoded with antibiotics to fight infection as the replacements graft onto natural bone, helping with the healing process. 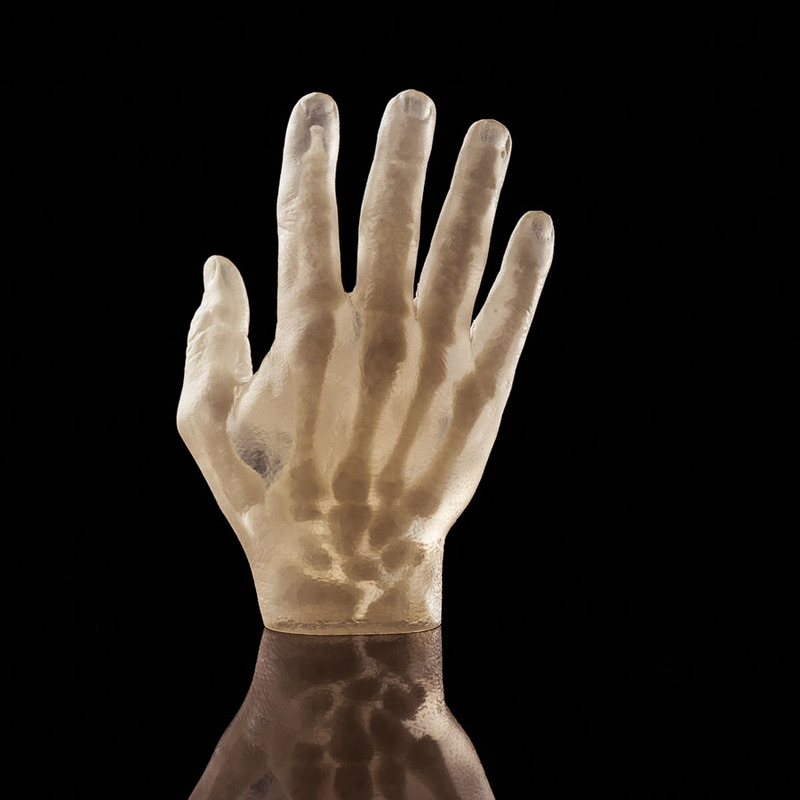 The team is also developing ways to use 3-D printing to model bodily structures, like vertebrae . . .
. . . and hands. The question intrigued surgeon Ahmed Ghazi: what if there were a way to simulate human organs so that students and residents could poke, prod, and perform procedures in scenarios that were lifelike enough to mimic the real thing? When the assistant professor of urology was introduced to Jonathan Stone ’16 (MS), a neurosurgery resident who holds a degree in biomedical engineering and has an interest in developing medical devices, the two began brainstorming. 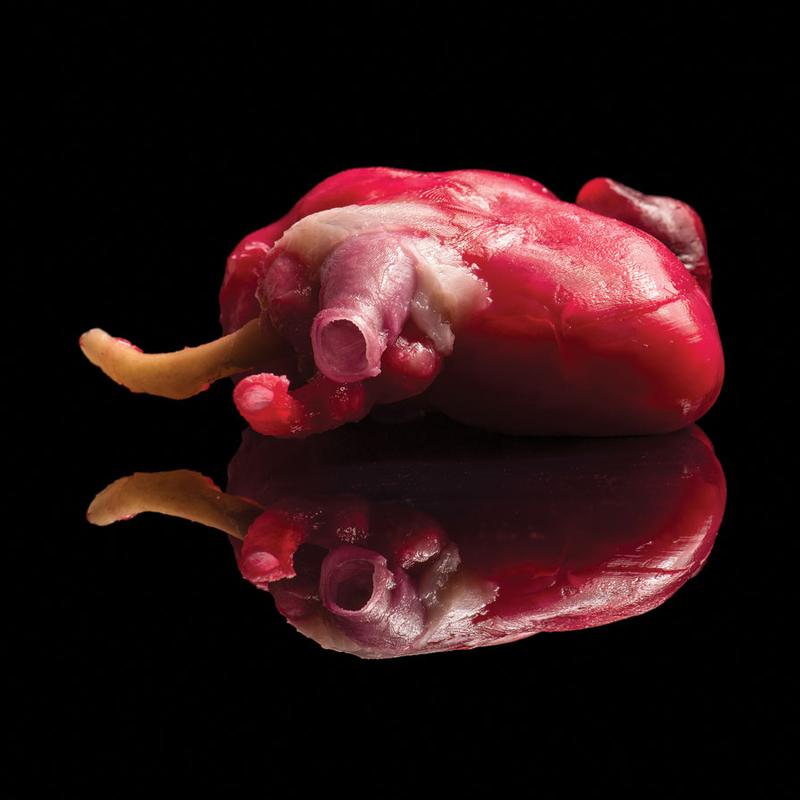 Using 3-D printing technology, imaging science, and a Jell-O-like plastic, they have developed a new way to fabricate artificial organs and parts of the human anatomy so realistic that the “model humans” can be used to train future physicians and could soon be widely used to rehearse complex cases before surgery. Work on the process—dubbed Simulated Inanimate Model for a Physical Learning Experience, or SIMPLE—began more than two years ago. The team’s initiative has begun to win accolades from colleagues and peers, including recognition from the American Urological Association, the nation’s largest organization of urologists, which awarded presentations of the SIMPLE program with top honors two years in a row. 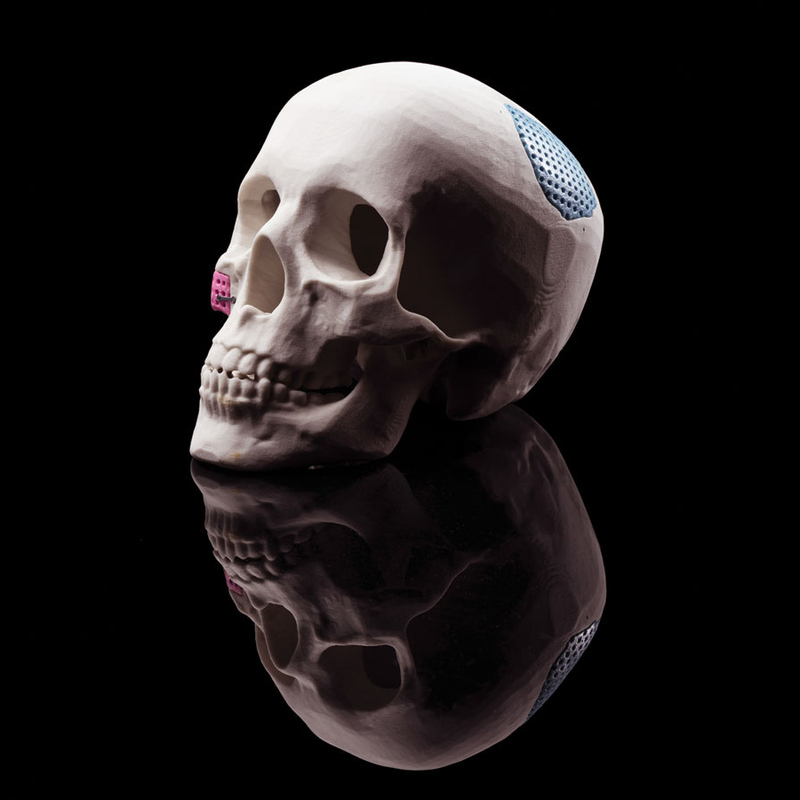 designs into molds built using a 3-D printer. In a process akin to casting a bronze statue, the molds are injected with a hydrogel which, after freezing, assumes a solid state. The water consistency of the hydrogel is identical to that found in humans, giving the artificial organs the feel of the real thing. A great deal of research and experimentation went into the process of formulating the hydrogel so that the final product not only has the right consistency but is also the correct color. “We think of it as a science and engineering, although at its heart it is really arts and crafts because at the end of the day, we are creating sculptures that just happen to be anatomical,” says Stone. In collaboration with the Department of Biomedical Engineering, the team subjected the models to a battery of scientific tests to ensure that the models had the same mechanical properties as real tissue. They also compared the performance of surgeons on the models and in real patients and found that there was a correlation between the two. The models allow surgeons and students to observe where the blood vessels enter and leave the organ and, when modeling cancer, the size and location of a tumor. 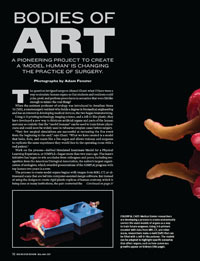 Surgeons can even cut the organ to take a look at the interior. And the models can provide insight into pathology. For example, the team can alter the concentration of the hydrogel to add denser masses to a liver, or a blockage in a kidney, or plaque in an artery. 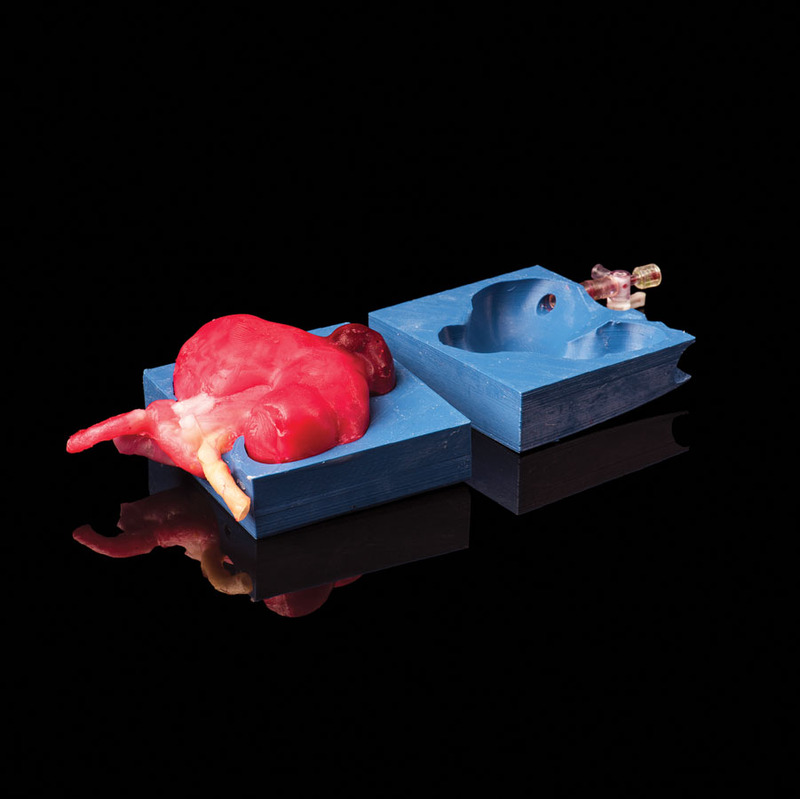 By assembling entire segments of a body, complete with artificial muscle tissue, skin, and fat, as well as livers, intestines, spleens, kidneys, and other organs and structures, the team has been able to simulate actual surgical procedures. While widespread use of such simulations is a long-term vision, Ghazi has used the models to practice real partial nephrectomies—procedures in which surgeons remove a tumor from a kidney while attempting to preserve as much of the healthy organ as possible. During those procedures, a key to success is avoiding surprises and anticipating potential complications. While complications are rare in the vast majority of instances, the size and position of tumors add complexity to the operation. In those instances, conducting a dry run in advance can help guide surgeons once the operation is conducted on a real patient. Rochester researchers are using the technology of 3-D printing to analyze an often slow-to-develop but extremely dangerous risk that can hide deep in the abdomen. Michael Richards, a research assistant professor in the Department of Surgery, and Doran Mix, a vascular surgery resident physician, are developing novel ultrasound technology to characterize the structure of abdominal aneurysms in the aorta and blockages in carotid arteries. The blockages, which interrupt the flow of blood in major arteries, often grow slowly enough that they’re undetected until they rupture, a complication that is usually fatal. Using 3-D–printed models of aneurysms made with polyvinyl alcohol, a water-soluble synthetic polymer, the team inserts the model aneurysm into a material that mimics the human thoracic cavity. There, they can study the aneurysms using ultrasound. Such analyses will help clinicians more accurately assess the risk of ruptures. The work is part of a collaboration between the Department of Biomedical Engineering and Carestream Health Inc., a Rochester-based medical device company. When a surgeon uses a titanium rod or plate to hold fractured bones in place, or installs a total joint replacement, the chances of infection are small. But when that happens, the results can be devastating. The hardware has to be removed. The bone has to be debrided and washed with antibiotics. Gaps created by infection-related bone loss are temporarily filled with antibiotic-releasing bone cement. The patients have to be kept on antibiotics. And months later, when the infection is finally eradicated and the cement can be removed, the surgeon “has to come up with some real magic to reconstruct that missing bone,” says Hani Awad, a professor of biomedical engineering and of orthopaedics. Awad says 3-D printing may help avoid many of the complications in a single step. As part of a consortium of research projects funded by AOTrauma, Awad and his team are using the new printing technology to fabricate bone scaffolds made of biocompatible material to replace the original bone tissue lost to infection. As part of the “printing” process, the scaffolds can be “ink-jetted” with antibiotics to fight the infection and with growth factors to stimulate replacement bone growth. 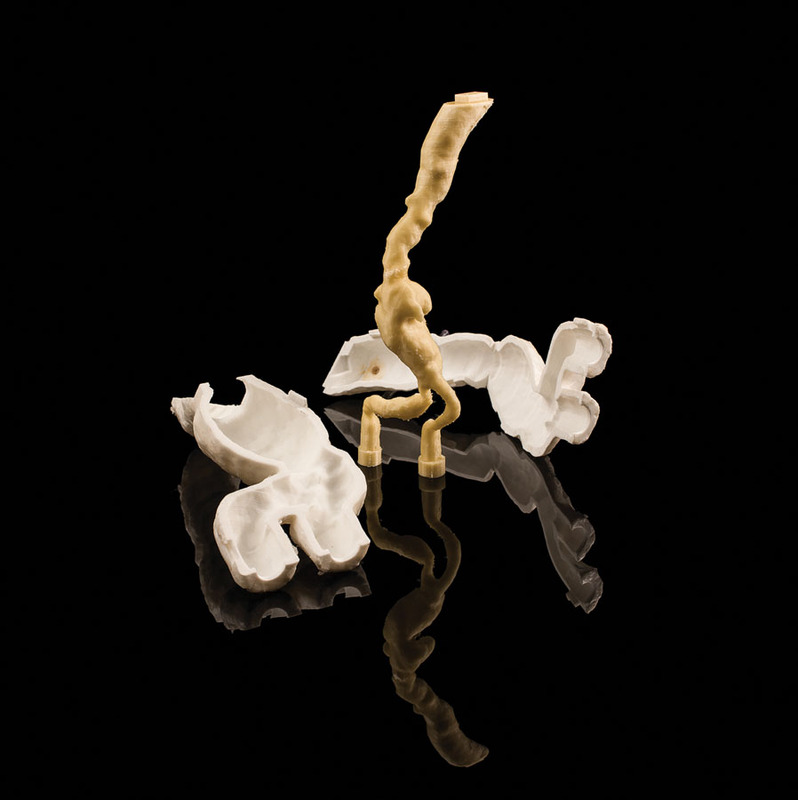 The therapeutics can be applied to the surface of the graft, or embedded uniformly in it, so they can be released gradually, as the graft dissolves, to ensure the infection is eradicated and to stimulate regeneration of the bone tissue.